A Conceptual Map for Integrative Therapists? 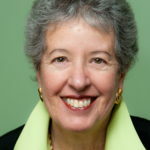 Internet Editor’s Note: Susan Heitler, Ph.D.’s newest book, Prescriptions Without Pills: For Relief from Depression, Anger, Anxiety and More, and its free website, prescriptionswithoutpills.com, offer treatment techniques, video examples, and handouts for therapists and the general public. Most therapists describe their theoretical orientation as integrative. Yet drawing from multiple therapy modes risks “shooting from the hip.” Can bump theory provide a unifying conceptual map to guide integrative treatment? This article posits that the answer is yes. Bump theory rests on one main premise: Life bumps create emotional distress; finding solutions to bumps relieves emotional distress. A bump refers to any challenging life situation: a conflict, frustration, disappointment, upsetting interaction, dilemma, decision, disagreement, issue, stress, or problem of any type. Bump theory thus upgrades the conflict resolution theoretical framework I first proposed in 1990 by changing the narrower term conflict to the broader term bump, connoting all kinds of difficult moments. Between a person and a circumstance (situational difficulties). For instance, John wants to exercise and at the same time wants to nap—an intra-psychic dilemma. John’s wife wants him to watch the baby instead of exercising or napping—an interpersonal dilemma. John worries when he looks at the baby that the baby seems to be feverish—a situational difficulty. The umbrella concept of bump theory incorporates many existing psychotherapy wisdoms. Bump theory embraces, for instance, cognitive-behavior understandings that between an activating event (a bump) and the consequent response, internal thoughts exert strong influence. It resonates with the psychodynamic assumption that earlier life events impact reactions to similar later life bumps. It is consonant also with family systems theory, usefully guiding couple and family therapy interventions (Heitler, 1990). the nature of emotional health. Trundling along a life pathway (represented by the arm), every person from time to time encounters a bump, (signified by the red exclamation point). On your wrist there is an actual bump at the base of your hand. Bumps trigger an immediate alert via negative emotions such as frustration, sadness, or nervousness. Then comes a choice point. Four routes, represented by the four fingers, each lead to a specific negative emotion or behavior. The thumb route, by contrast, leads to resumption of well-being. Depression: Fold Road involves giving up, triggering depression. Anger: Fight Road uses anger (irritation, criticism, blame, etc.) to intimate others into submission to what the dominating person wants. Anxiety: Freeze Road (think deer in headlights) immobilizes problem-solving, perpetuating anxiety. Addictions: Flee Road offers escapes into distracting habits to remove the bump from awareness via substances, obsessions, or compulsive habits. 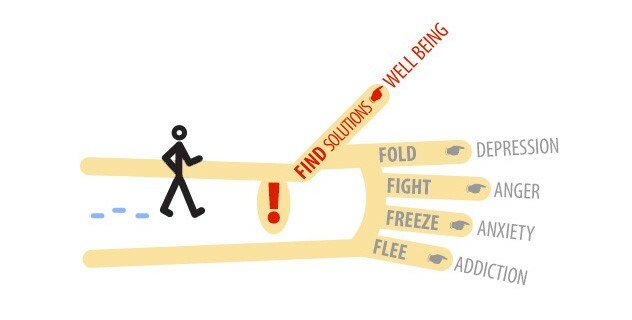 Well-being: Find-Solutions Road takes the thumb route of problem-solving. How Can Bump Theory Guide Integrative Therapists? Guiding clients to solutions to their life bumps. Therapists mainly ask how and what questions and affirm clients’ responses to facilitate problem-solving. When clients are stymied, therapists also may offer solution ideas. With couple conflicts, therapists also must keep a tight rein on collaborative communication, blocking adversarial comments and facilitating listening. Relieving depression, anger, and anxiety reduces suffering, as does ending addictive habits. In addition, because strong feelings decrease frontal lobe functioning, reducing emotional arousal may be necessary for progress on the thumb route. Therapist techniques for calming distressed feelings may include mindfulness, narrative therapy, information-sharing, CBT, EMDR, EFT (acupoint tapping), NLP techniques (Andreas, 2012), and “Do or Become” visualizations (Heitler, 2016). Beitman’s 1986 terms pattern recognition and pattern change describe this therapy task. Earlier life experiences and also parental models train bump-response routes. For instance, John learned his father’s depression-inducing bump response of ignoring his own concerns to comply immediately with his wife’s preferences instead of seeking win-win options. Wachtel’s concept of cylical psychodynamics extends bump-response pattern recognition to couples therapy (2014). Excessively emotionally intense reactions tend to occur when current life bumps share an element in common with a painful earlier life experience. John, for instance, reacts with panic at his child’s fever because his own younger sibling had died at a young age from a sudden illness. Emotion Code, Gestalt techniques, and the visualization “That Was Then, This Is Now” (Heitler, 2016) can augment conventional psychodynamic methods for removing at the roots the unhelpful residues of earlier bump experiences. With regard to pattern change— that is, to developing healthier templates—therapists may intervene with CBT techniques such as highlighting cognitive errors, teaching anger management, and coaching collaborative decision-making (Heitler, 1997, 2003). What Specific Therapy Challenges Does Each Negative Bump Reaction Route Pose? Each of the four detours from the Thumb Road of finding solutions poses specific therapy challenges. Because problem-solving capacity diminishes as anger rises, therapists teach anger-prone clients to exit from provocative situations before percolating anger can boil over with hurtful words, yelling, or physical attacks. Angry focuses attention externally, onto others. To refocus an angry client inward, one strategy utilizes the potent question, “What do you want?” If the client answers, “I want him to …!” the therapist can suggest the alternative sentence-starter, “I would like to…” This wording change shifts the client’s focus to within him/herself. Asking next, “And what can you yourself do differently to get what you want?” can further consolidate constructive problem-solving. Depression stems from feelings powerless and small, which induces the Seligman “learned helplessness” phenomenon. A 3 P’s visualization can rectify this power shortage: Pinpoint the bump, Pump up clients’ inner sense of empowerment, and then Problem-solve (Heitler, 2016). Videos on prescriptionswithoutpills.com and in my TEDx talk on lifting depression illustrate this intervention. Couples therapy can reduce depression by teaching spouses to replace dominant-submissive interactions with cooperation. I therefore regard marriage therapy as the treatment of choice for depressed individuals who are married. When anxiety blocks thinking therapists can re-start thinking by suggesting, “Close your eyes. Now say aloud each thought that evokes anxiety. I’ll write them down as a list.” Circle back then to address the list one concern at a time, clarifying what additional information might help and generating solution options. Transactional analysis (TA) therapists suggest the mantra, “The best antidote to anxiety is information.” Data-gathering launches problem-solving. Looking at this habit in the best possible light, what is it intended to accomplish? What might be a better plan of action for accomplishing the same goal? What Does Bump Theory Regard as the Essence of Emotional Health? Emotionally healthy people consistently respond to life bumps with problem-solving. When the kitchen sink stops up, instead of becoming self-critical (Fold Road), blaming (Fight Road), panicking (Freeze Road), or looking for the bottle of Scotch (Flee Road), they find a way to fix the sink. Four skill sets enhance intra-psychic problem-solving, and, all the more, inter-personal problem-solving (i.e., conflict resolution). Emotional stability: Sustaining emotional calm optimizes problem-solving effectiveness. Collaborative dialogue: Expressing viewpoints respectfully plus bilateral listening (listening to one’s own and also to others’ concerns) are essentials (Heitler, 1999, 2003). 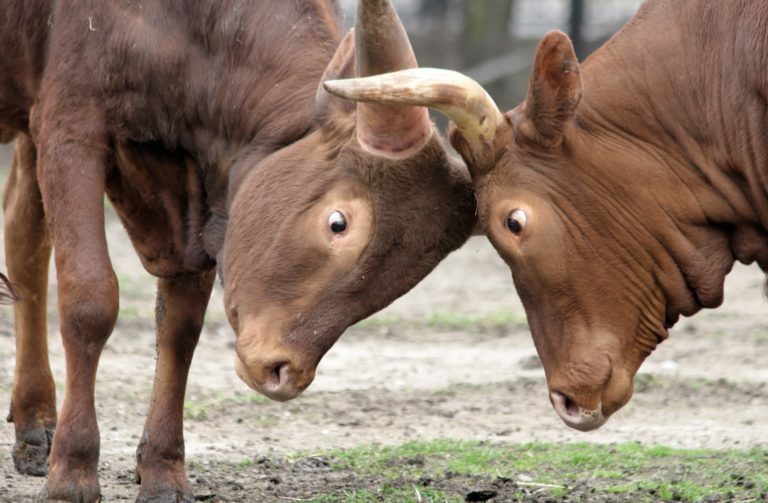 Win-win conflict resolution: Fully effective bump solutions respond to all concerns of all parties. Positivity: Expressing would like to rather than don’t like, plus smiles, helpfulness, affection, appreciation, agreement, enthusiasm, and gratitude make problem-solving dialogue feel safe. With these skill-sets, Find Solutions Road becomes the main highway for meeting challenges. By contrast, narcissistic individuals, for instance, create bumps by assuming that my way is always right and dismissing others’ perspectives. Individuals with borderline features respond to bumps with overly intense emotions that block insight, listening, and cooperative problem-solving. Problem-solving responses to life’s bumps sustain emotional health. Fold, Fight, Freeze, and Flee Roads lead respectively to depression, anger, anxiety, and addictions. Individual, couple and also family therapy utilize past-, present-, and future-focused interventions to assist clients in a) finding solutions to their current life bumps, b) relieving their negative emotions, and c) developing more effective bump-reaction patterns. Beitman, B. (1986). The structure of individual therapy. New York: Guilford. Heitler, S. (1990). From conflict to resolution. New York: Norton. Heitler, S. (1997). The power of two: Secrets to a strong and loving marriage. Oakland: New Harbinger. Heitler, S and Hirsch, A. (2003). The power of two workbook: Communication skills for a strong & loving marriage. Oakland: New Harbinger. Heitler, S. (2016). Prescriptions without pills: For relief from depression, anger, anxiety and more. New York: Morgan James. Norcross, J and Prochaska, J, (1988). A study of eclectic (and integrative) views revisited. Professional Psychology: Research and Practice, 19(2), 170-174. Wachtel, P. L. (2014). Cyclical psychodynamics and the contextual self. New York: Routledge.